Posted by randydeutsch in architect types, BIM, books, career, change, employment, management, software architects, the economy. Architects, in an effort to distinguish themselves in a competitive market and work environment, have started to call themselves different things. Not that they’re going to give up the title architect anytime soon. They’re in search of a title that more accurately qualifies – and clarifies – what they do as an architect. With the advent of social media, what we call ourselves in our profiles goes a long way toward how others treat and work with us. Sometimes we find ourselves using titles that we ourselves aren’t certain what they mean. And good thing. Because we often use them as much to obfuscate as to communicate. Many of the newest titles are conjunctions, conflations or co-joining of two or more existing titles – such as business and design – that are meaningful when used independently but when combined leave us ashamed and others feeling abused. In fact, if you hear someone say “I’m at the intersection of design and business” don’t meet them there – they’re probably lost. Here’s a field guide to some of the ways we are referring to ourselves – and to each other – in this make-it-up-as-you-go world we find ourselves living and working in. One definition is offered to confuse or Abuse. The other you’d be better off to Use. is someone who sees everything as an opportunity for improvement. is someone who has to sell themselves and their talents every time they walk into a room. primarily concerns themselves with how to create a successful communication, product, or experience. is an agent who specifies the structural properties of a design object. In other words, there are as many definitions as there are designers. A Design Consultant is a person who borrows your watch, tells you what time it is, pockets the watch, designs a new one for you, sends you a bill for it and puts a lien on it when you don’t pay in 120 days. Abuse: Specialists in human factors, psychology, business, design, engineering and manufacturing who provide full service consulting for building and product innovation and design. Use: Freelancer. An architect who can’t find full-time employment. Abuse: Uses project management, design, strategy and supply chain techniques to control a creative process, supports a culture of creativity and build a structure and organization for design. Use: A manager of design projects. See: This is a comprehensive reference book for anyone seeking an introduction to the basic concepts and principles that inform the management of design projects, teams and processes within the creative industries; and her earlier work, here. Use: Someone with an undergraduate anthropology diploma and a 3 year degree in architecture. Abuse: An unorthodox or unconventional designer. Used more often in web and graphic design. Pure unadulterated business jargon. An entity that is recognized for having innovative ideas or business ideas that merited attention. ‘Go to’ subject-matter experts in your industry. Period. Here’s how to package your ideas to share with others. Use: Only when others call you this. And even then, don’t ever use it to describe yourself. Abuse: Someone who writes his/her thoughts and feelings online. Use: Anyone who contributes to a blog or online journal. And I mean anyone. Abuse: Someone who knows what it means to manage the people side of the change equation. Abuse: Business people trained in design methods. Use: Design people trained in business methods. Design thinkers are designers who achieve innovative outputs that drive business success. See this and this and especially this. Abuse: Design Principals and Senior Designers used to hand off their building designs – and Project Managers and Architects their redlines – to CAD operators. With BIM, it no longer works this way. Like Artworkers in graphic design, BIMworkers initiate, commence, pursue, resolve self-edit and complete the work. If they had money, they would also own it. Use: BIM Modelers. BIM Managers, BIM Coordinators and BIM Operators will thank you for it. Abuse: Someone who uses the word “wayfinding” in casual conversation. Use: An architect knows that if you have to use signage, you’ve failed. Architecture is its own wayfinding. Use: Someone who uses design to achieve key business objectives. See Design Thinker and Design Guru. See: To be a design strategist, you either have to be an IDEO veteran, Stanford University lecturer on design, the founder of a customer experience design company – or know someone who is one. Here are the eleven skills sets for what it takes and here and here. Abuse: Someone who organizes people, infrastructure, communication and material components of a service in order to improve its quality, the interaction between service provider and customers and the customer’s experience. 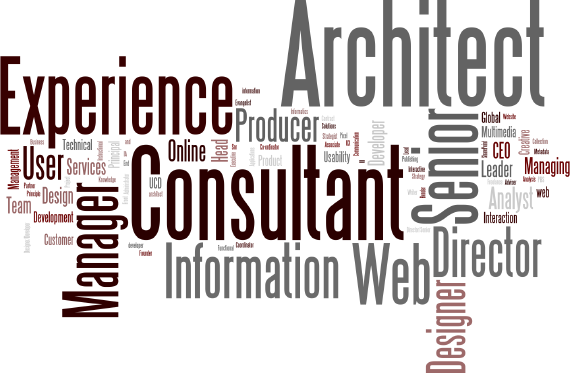 A cross-disciplinary practitioner who combines skills in design, management and process engineering. Abuse: See Form giver. Someone who gives shape to products, objects and buildings. Use: Someone who really gets design, puts it to good use and will lead others into the twenty-first century with creative strategies. See this, probably the best new book on the topic. Where X can be Culture, Interpretation, Learning, Systems, Collaboration, Co-Creation, Creativity, Innovation, Mischief, Imagination, Technology, Information, Fun. As in Chief Storytelling Officer. Someone who has traded real work for knowledge work. A begrudging strategist. Abuse: A corporate title indicating hierarchy, authority and power. A high ranking officer who gets an office with a window. Use: Leader. A high ranking officer who gets a windowless office. Abuse: Entrepreneurs who operate by creating business opportunities and practices inside their organization. Employees who – in addition to their workload – develop client relationships and bring in work. Abuse: An entrepreneur who continuously comes up with new ideas and starts new businesses. Abuse: Principal responsible for client, project, financial, design management and coffee making. Abuse: Whether Sustainability Advocate or IPD Advocate, they’re a person who publicly supports and recommends a particular cause or policy. Abuse: Passionate arbiter of knowledge who enjoys learning while teaching. Abuse: Someone who wastes other people’s time and resources by laboriously advocating the use of such systems as Six Sigma, TQM, Lean and other business management methodologies. Abuse: Someone who works at any of the tasks of planning, acquiring, searching, analyzing, organizing, storing, programming, distributing, marketing, or otherwise contributing to the transformation and commerce of information and those (often the same people) who work at using the knowledge so produced. Abuse: Someone who uses industry techniques such as gathering intelligence on competitors, generating leads and prospects, managing presentations and designing and generating successful business models, aimed at attracting new clients and penetrating existing markets. Abuse: Someone who engages clients by focusing attention on the issues and individuals at hand, listening both to what they say and what they leave unsaid, framing the immediate problem from their perspective, envisioning with them how a solution might appear and committing jointly to the actions and resources that will bring it about, all to gain the confidence and earn the trust of their clients. Use: Architect. While David Maister’s guide is a classic, this and this are also helpful. Now it’s your turn. Are there any titles you are aware of that you don’t see here?